Southampton's first workhouse came into being as a result of a bequest by one John Major who, in 1629, left £200 to provide "a house of twelve rooms for the habitation of poor people". In the next year, his executor arranged with the Corporation, that on the latter building a poor house, the legacy should be devoted to the purchase of land for the poor to work on. Two years later, premises were provided, but by 1668 the buildings had fallen into a bad state. The poorhouse transferred to what became St John's Hospital (founded in 1671 for the instruction of lads in the woollen trade,) on French Street. In 1753, under the provisions of Knatchbull's Act of 1723, Southampton parishes set up a common workhouse at Bull, or Bugle Hall, a former residence of the Earl of Southampton, that ran from the lower part of Bugle Street towards Westgate. In 1771, a proposal was instigated to unite (by special Act of Parliament) Southampton's parishes into a poor law Incorporation. This would allow more local autonomy over the management of poor relief, such as the profitable employment of the poor in textile manufacture. An Act for better regulating the Poor, and repairing the Highways, within the Town and County of the Town of Southampton (13 Geo.3. c.50) was passed the following year. A board of guardians was formed which included the Mayor, recorder, bailiffs, senior aldermen, any other resident justices of the peace, and eighteen parish representatives — four each from All Saints, Holy Rood and St Michael's, and two each from St John's, St Lawrence's and St Mary's. 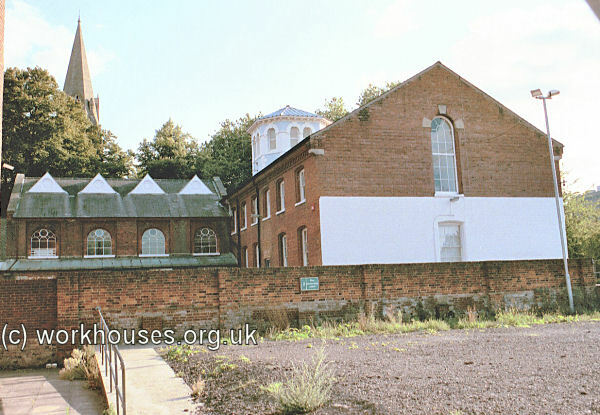 In 1776, the Incorporation decided to build a new workhouse on the north side of St Mary's churchyard. The old St John's Hospital was sold off for £425, and several years later became the site of a theatre. SOUTHAMPTON contains about 4 square miles, one-fourth of which is common, and about 9,000 inhabitants. There is a mill for twisting silk which employs a few children, and a carpet manufacture, which works 4 or 5 looms, but no other manufacture. The number of houses paying tax could not be estimated, but it may be estimated at 700. Prices of provisions: Beef, 6d. to 8d. per lb. ; mutton, 6d. to 7d. ; veal, 8d. ; bacon, 10½d. ; butter, 15½d. ; bread, 1s. 11½d. the half-peck loaf; potatoes, 10d. a peck; coals, 37s. a chaldron. Wages of bricklayers, carpenters, etc., 15s. to 16s. a week. Common labourers, 1s. 8d. to 2s. a day. Number of ale-houses, 30. One friendly society. The Poor are partly maintained in a Workhouse, partly at their own homes. At present (October, 1795) 120 persons in the house, of whom 50 are children under 14 ; the rest mostly old people. 18 children and 4 old men work at the silk mill. Bill of fare in the Workhouse: Breakfast—every day except Monday, onion broth; Monday, bread and butter. Dinner—Sunday, beef and vegetables; Monday, broth and bread; Tuesday, pork and vegetables ; Wednesday, Friday, bread and butter; Thursday, salt beef and vegetables; Saturday, bread and cheese. Supper—every day, bread and cheese or butter. Two cups of beer (near 3 pints) are allowed to grown persons, and a proportionate quantity to children. Rates, for the last 18 years, on an average 4s. in the pound on ¾ of the net rental. Southampton's Local Act Incorporation status mad it largely exempt from the provisions of the 1834 Poor Law Amendment Act. The Incorporation remained in operation until 1909 when it was replaced by a Poor Law Union. The 1776 workhouse, with its capacity of only 220 inmates, could accommodate only about a fifth of the city's paupers. By 1843, inmates were four to a bed with no segregation of the sexes, and increasingly insanitary conditions. A proposal in 1845 to build a new workhouse on the Common came to nothing, as did a scheme to buy Archer's Lodge in 1863. In 1865, a visiting Poor Law Inspector roundly condemned the "mixing together of all classes, including old, infirm and idiots, in rooms in which it was almost impossible for human beings to live." 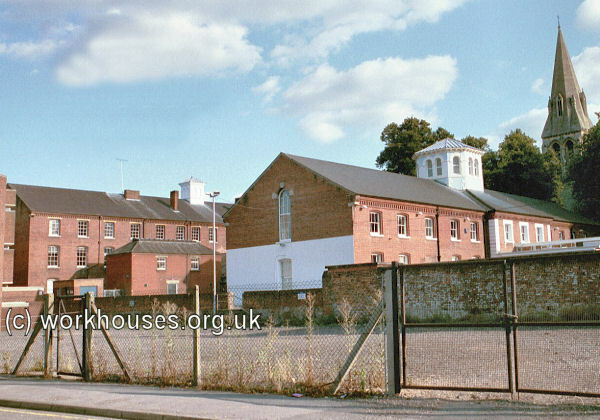 It was then decided to build a new workhouse on land adjoining the existing site. In 1865, a competition for suitable plans for a new workhouse was held amongst local architects. Although the winning entry appears to have been by Mr A Bidborough, the design actually used was by Mr TA Skelton. The official laying of the foundation stone was on 7th August 1866. The building contract for £20,552-11s. was placed with Bull and Sons. However, by the time of its completion in November 1868, various extra costs involved in digging foundations, providing a new water supply, walls and railings, internal fittings etc. had pushed up the cost to £31,200. To the west, at the front of the site, was a block of offices and vagrants' wards — these were demolished in 1948. Southampton workhouse entrance block, 1870. Behind this were four parallel ranges, the first two linked by a central spine. The front range contained the master's quarters, and accommodation for able-bodied paupers. Southampton front block from the west, 2000. The second range contained accommodation for aged paupers and was linked to the first range by a central spine containing the dining hall, kitchen, and chapel. Southampton rear of front block and dining hall from north, 2000. 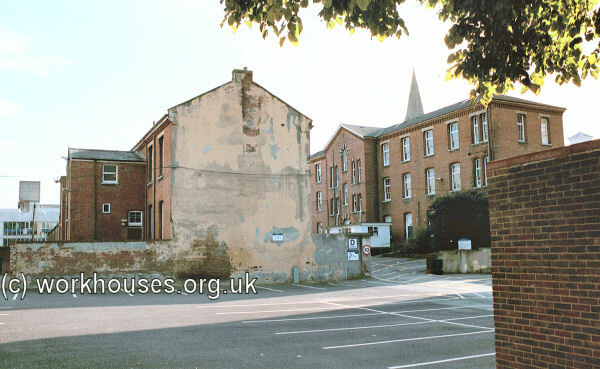 Southampton aged paupers' block (left of picture) from north, 2000. The third range was the infirmary block, and the fourth infectious wards. Southampton infectious wards and infirmary from north, 2000. 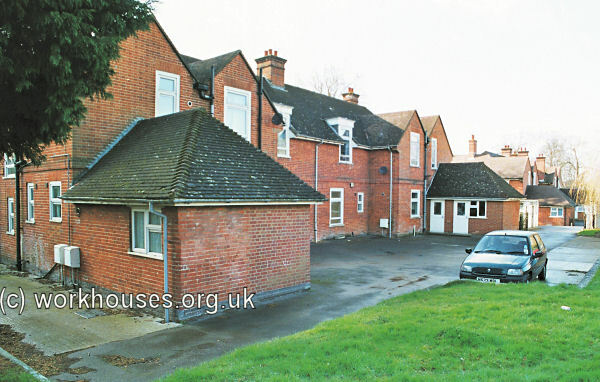 Opposite the workhouse, boys' and girls' schools were located in two converted houses. In 1902, following the opening of a new infirmary at Shirley Warren, the workhouse accommodation was rearranged and the infectious wards greatly altered. From 1904, to protect them from disadvantage in later life, the birth certificates for those born in the workhouse gave its address just as 154 St Mary Street, Southampton. Between 1908 and 1922, the Incorporation absorbed a number of parishes previously belonging to the adjacent South Stoneham Union. In 1926, Southampton took over the South Stoneham workhouse, relieving the Guardians of the union of the financial burden of its operation. In 1940, the building was taken over as an emergency food centre and for housing homeless families. In 1948, work began on its conversion into a Technical College, with classes beginning the following year. In 1995, the establishment became Southampton City College. 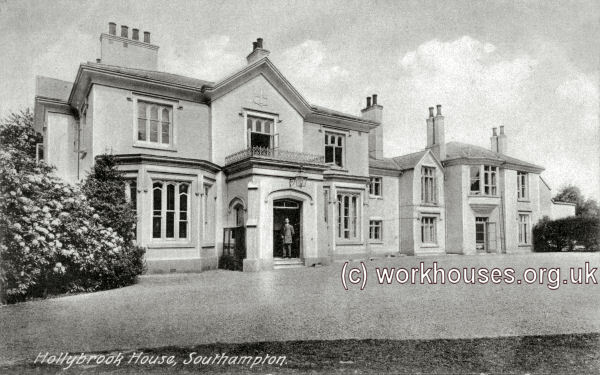 In 1899, the Southampton Guardians decided to erect a separate union infirmary at Chilworth Road (now Tremona Road), Shirley Warren, to the north-west of Southampton. The site chosen was deliberately chosen to be large enough to also accommodate a new workhouse should that ever be required. The new infirmary was designed by AF Gutteridge and the building contractor was H Cawte. The foundation stone was on March 6th, 1900, by Charles Thomas, Chairman of the Board of Guardians. The hospital was opened in 1902. The hospital design was based on the typical pavilion-plan layout of the period with a administration block at the centre, linked by covered ways with two female pavilion wards at the west and three male wards at the east. The hospital's location and layout are shown on the 1930s map below. Southampton Union Infirmary from the south, c.1904. 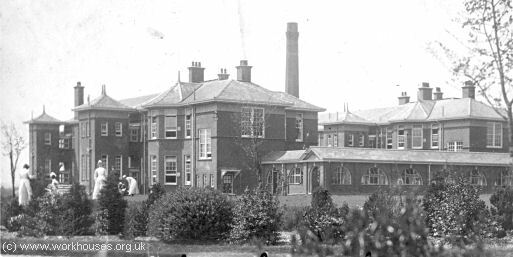 Southampton Union Infirmary from the north-east, c.1905. An additional ward block was erected to each side in 1911, again designed by AF Gutteridge. 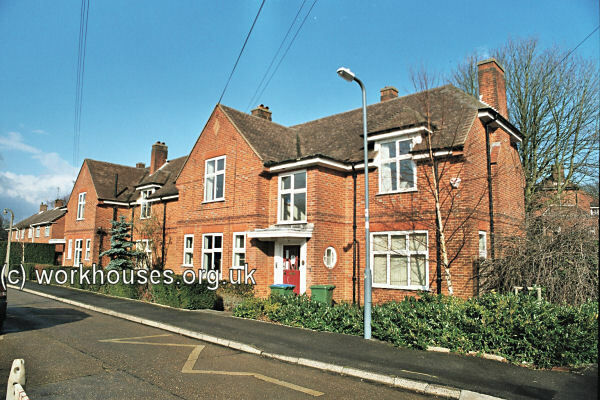 A three-storey nurses' home at the east of the site was erected in several phases beginning in 1899 and extended in 1911, 1934, and the 1980s. The Matron's house was located to its north. A lodge stood at the infirmary entrance at the south-east of the site. Southampton Union Infirmary entrance lodge and nurses' home from the south, date unknown. 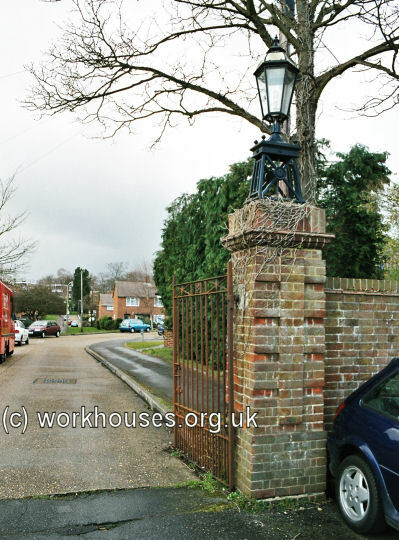 As with the workhouse, the infirmary had a euphemistic address for use on birth certificates of 1a Chilworth Road. In 1930, following the abolition of the workhouse system, the infirmary was appropriated by the Southampton Borough Council and was renamed the Borough Hospital. It joined the new National Health Service in 1948 and continues to operate as Southampton General Hospital. 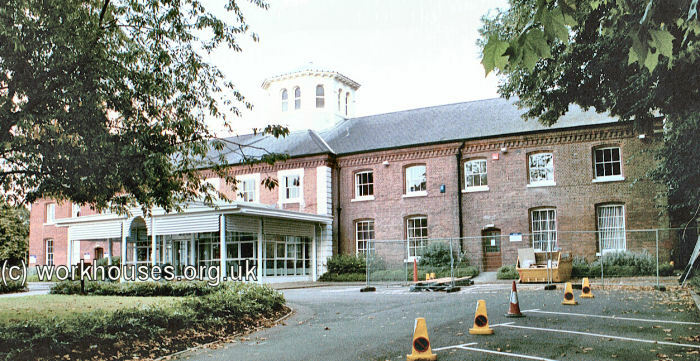 The old administrative and ward blocks were demolished in the 1980s and a new hospital now stands on the site. All that now remains of the old buildings are the nurses' home and a fragment of the covered walkway that once linked the ward pavilions. 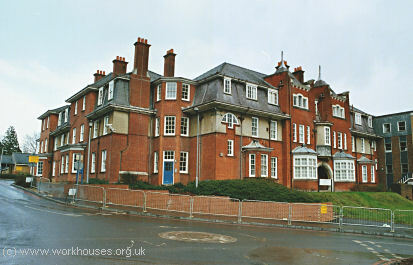 Southampton Union Infirmary nurses' home from the west, 2005. 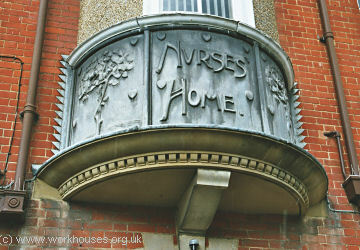 Southampton Union Infirmary nurses' home detail, 2005. Southampton Union Infirmary covered walkway, 2005. 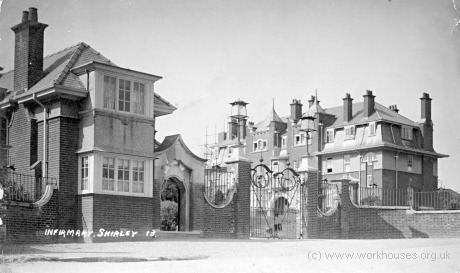 In 1910, the Guardians paid £3,200 for house and 13 acres of grounds about half a mile to the north east of the Shirley Warren infirmary. 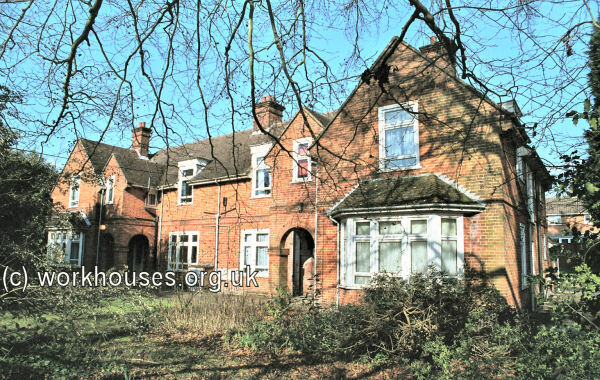 The house, which dated from 1835 and known as Hollybrook House, was to be used as a home for 150 boys and opened in August 1911. Hollybrook House from the south, date unknown. An additional 13 acres of land was subsequently purchased on which a group of cottage cottage homes was opened in March 1923. The old house was then just used to house seventy boys aged 12 to 16. Children aged eight to twelve were accommodated in cottages, with either ten boys or ten girls under the care of a foster mother and a "house girl" — one of the older girls who did some of the domestic chores. 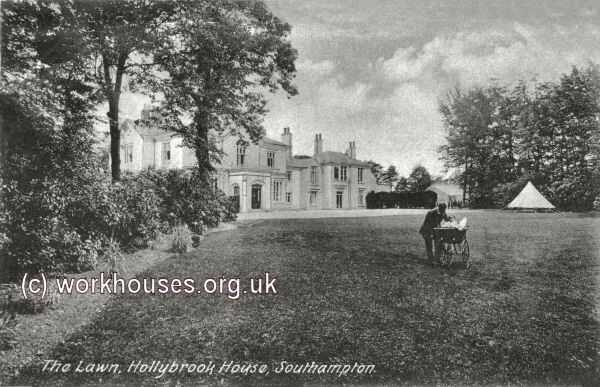 Southampton, Hollybrook House from the south, date unknown. 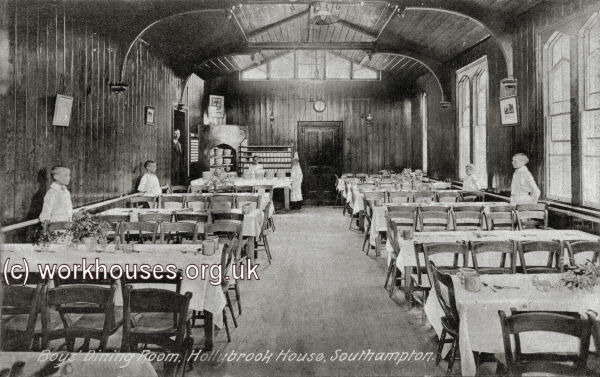 Southampton, Hollybrook boys' dining room, date unknown. Two pairs of houses were located on Seymour Road. Hollybrook — Seymour Road, 2005. 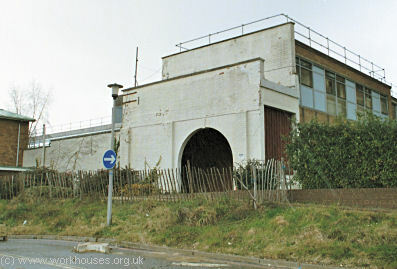 Hollybrook — Seymour Road rear view, 2005. 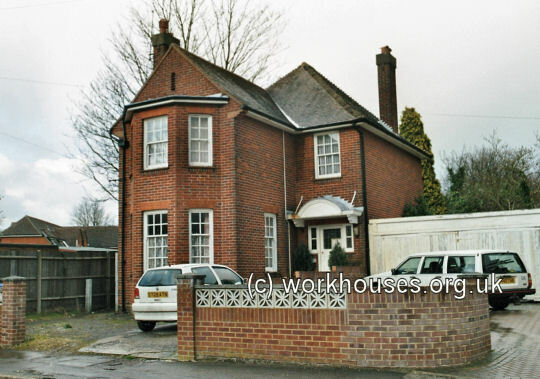 A house on the corner of Winchester Road and Seagarth Lane was used as a receiving home. Two further blocks of houses were located to the north of Seagarth Lane. 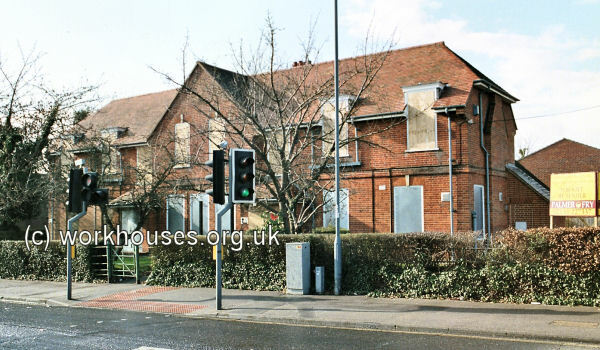 The four-to-eight-year-olds housed were housed separately in a home called Oatlands located at the junction of Winchester Road and St. James' Road. In the 1930s, a farmhouse on the estate was converted to provide staff accommodation, and a house was built at the Seagarth Lane entrance for accommodating the assistant superintendents. 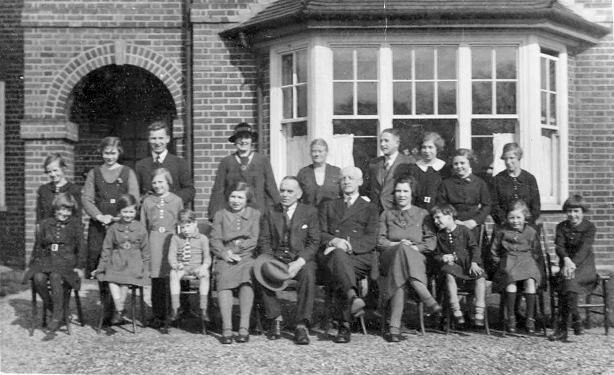 In October 1936, a two-storey nursery was opened at the east of the site which could hold 27 babies from birth to two years, and 36 children from two to five years of age. There was also accommodation for up to ten residential staff. Hollybrook 1936 nursery block, 2005. A further children's house was also erected. 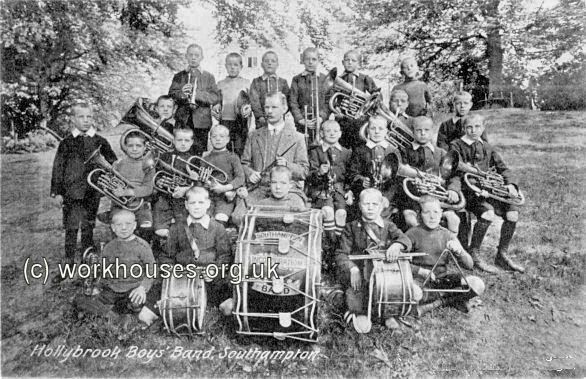 Like many other workhouse children's homes, Hollybrook ran a boys' band. The site layout at the end of the 1930s is shown on the 1946 map below. Jim Woollison has kindly contributed a picture of one of the Seymour Road cottages taken on George VI's coronation day in 1937. His mother-in-law Rosina is second from the right on the front row. Hollybrook Seymour Road, 12th May 1937. Following a decline in demand for places, the nursery closed in the mid 1955. Hollybrook House was demolished in the 1950s and housing estate was built amongst the cottages. 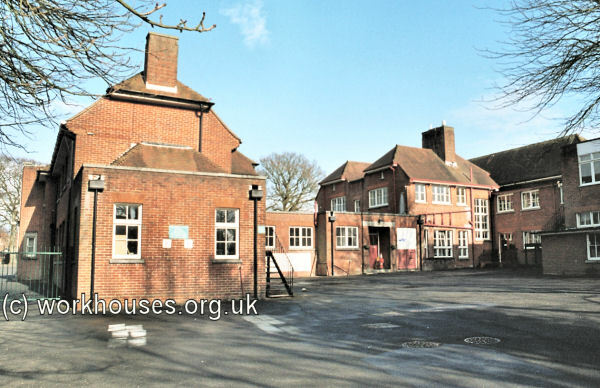 In 1958, the original nursery was converted to become the home of Hollybrook Infants and Junior school which opened on 8th September of that year. The surviving Hollybrook houses are now used for residential purposes. The former nursery has now become a school. 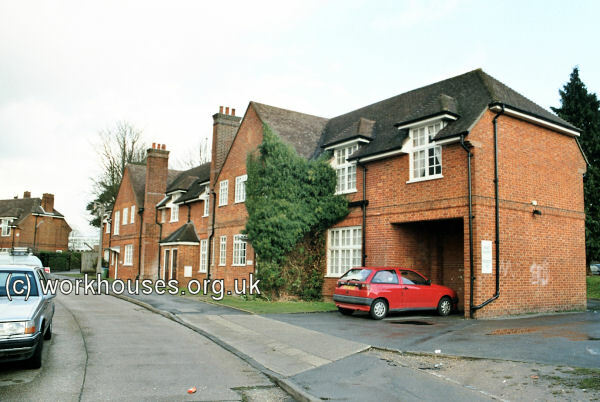 From 1925 to 1936, William Golding was a resident of the Hollybrook homes. His recollections of life at the homes can be heard in a series of recorded audio clips. Southampton Archives Service, Civic Centre, Southampton SO14 7LP. has a rich assortment of records going back as far as 1711. Holdings include: Guardians' minute books (1818-1930); visitors' books (1779-1833); settlement examination registers (1711-1901, with gaps); settlement of bastards registers (1811-39); examination and removal orders (1817-42); papers for emigration of children to Canada (1902-07) etc. A Picture of Southampton by Phillip Brannon, 1850. The Builder 26th April, 1902. The Incorporation's early correspondence with the central poor-law authorities is online on the TNA website .